No figure in American public life has had such great expectations thrust upon him, or has responded so poorly. At the age of 36, Ted Kennedy found himself the last brother, the champion of a generation's dreams and ambitions. He would be expected to give the nation the confidence to confront its problems and to build a fairer society, at home and abroad. He quickly failed in spectacular fashion. On the basis of his family name he was elected to the U.S. Senate while barely old enough to serve. Then, late one night in the summer of 1969, he left the scene of a fatal automobile accident in Chappaquiddick Island. The death there of a young woman would haunt and ultimately doom his presidential ambitions. Republicans turned his all-too-human failings -- drinking, divorce, and philandering -- into a condemnation of his liberal politics. But as the presidency eluded his grasp, Kennedy was finally liberated from the expectations of others and transformed himself into a symbol of wisdom and perseverance. He built a deeply loving marriage with his second wife, Vicki Reggie. He embraced his role as the family patriarch. And as his health failed, he anointed presidential candidate Barack Obama, whom many commentators compared to his brother Jack. The Kennedy brand of liberalism was rediscovered by a new generation of Americans. 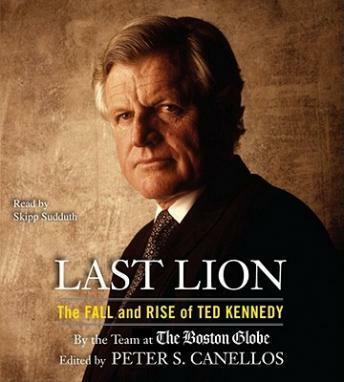 Drawing heavily from candid interviews with the Kennedy family and inner circle, Last Lion captures magnificently the life and historic achievements of Ted Kennedy. Actually 3.75 stars Kennedy was amazing-- I had no idea how impressive he was. I learned a lot. I really enjoyed the book because of the man it was about. For me, however, there were no new insights into the tough stuff like plane and car accidents, both of which led to the deaths of others and resulted from his bad judgment. Nor, did I learn enough about the roots of his complexity.